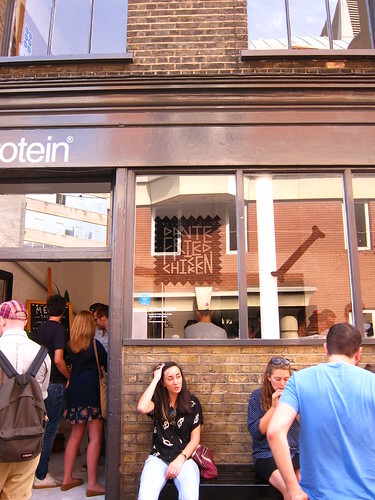 Fried chicken is one of those things that Londoners crave. It doesn't even have to be that good if the numerous "Chicken Cottages" and "Dallas Fried Chicken" have anything to go by. Having heard about Dante's Fried Chicken through the internet's grapevine (also knows as twitter), I definitely raised an eyebrow and wondered how good their chicken was. 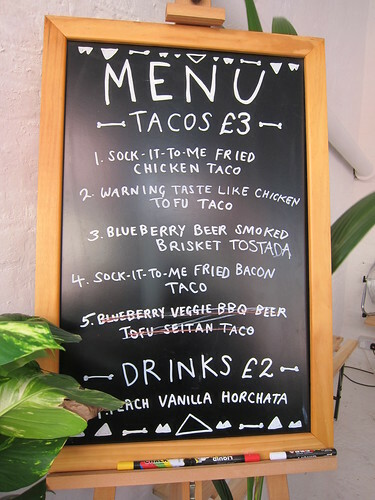 Coinciding with a friends state of malaise, I thought we would head on down to Shoreditch and give these fried chicken tacos a go. A three day pop up in advance of a proper restaurant being opened up in the US, it seemed strange to have a popup in London, but there was an aspect of buzz to it, so I thought it would be worth popping in to see what all the fuss was about. The initial feedback had not been great. The food had run out by 2pm the previous day, disappointing many who had expected them to be serving well into dinner time. By all accounts, this was a perfect example of giving a bad first impression. However, I was not to be deterred. Turning up bright and early (well, 2pm when it opened) we got in the queue and ordered. With a slightly curtailed menu compared to what was on their Facebook page, I got my mitts on the chicken, beef and pork varieties. The "taste like chicken tofu" was unsurprisingly left behind. 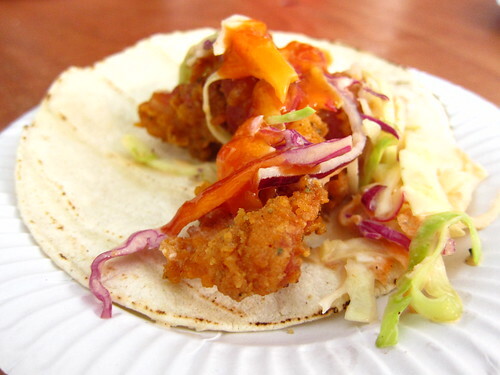 On the whole, the taco's were pretty decent, if a little on the small side. At £3 each with beers being handed out to all those who wanted one, I didn't think it was actually that bad value. The chicken version worked out pretty dull. Evenly seasoned, well fried, but nothing special. 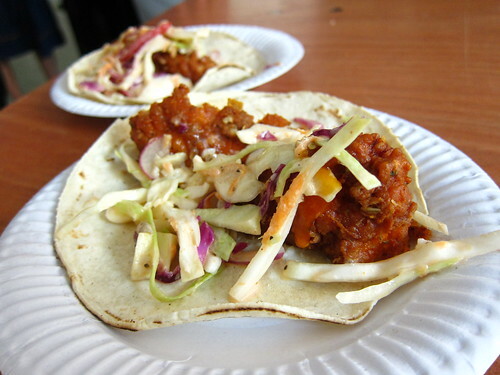 A splash of chilli sauce and a smattering of coleslaw finished off the ensemble. The beef brisket was juicy but overly sweet, not too surprising as it was braised in blueberry beer, but still. The best of the lot for me was a strip of bacon, battered and fried. Now, I love bacon, battering things and definitely frying things, but this was a heart attack waiting to happen. I wolfed it down with glee, and restrained myself from ordering another. The food was alright, and I like the novelty of visiting a popup like any man, but found myself underwhelmed, and not really helped by the frenetic staff trying to keep up with orders. On a larger scale, more permanent scale, I can definitely see how this could work and maybe even flourish in London, but in the meantime, I wish Dante all the best in LA. After the food, we decided to wander around the local bars, sampling a reversed gin and tonic at the frankly bewildering but very good Whistling Shop (irradiated cocktails anyone?) and walked through a fridge to find yet more cocktails (at the equally excellent Mayor of Scaredy Cat Town). A great if a little odd day. Looks a lot nicer than your usual chicken joint! I have a soft spot for fried chicken!! love it! the warning tastes like chicken tofu taco might even get an order from me!